Whenever I cook turkey or chicken I like to save the bones and store them in the freezer until I have enough to make some stock. I had finally saved up enough turkey bones to make some turkey stock and I knew exactly what I wanted to use it for. I had come across the idea of using leftover turkey and turkey stock to make a turkey pho a while ago that sounded really good. I had been wanting to try making a pho for a long time and now was the perfect opportunity. Pho is a Vietnamese rice noodle soup with a clear broth that is commonly flavoured with star anise, cloves, cinnamon and charred ginger. Beef is more commonly used but any meat will do and this time leftover turkey was on the menu. Once the stock was made it was pretty easy to infuse it with the star anise and other pho flavourings and the rest of the soup was a piece of cake to make. The leftover turkey pho turned out great! It was nice and light and fresh and I really enjoyed the star anise flavoured turkey broth. One of the things that I liked most about the pho was all of the fresh garnishes as they reminded me of warmer days. I will definitaly be making pho again and I think that next time I will be try the more classic beef version. Simmer the turkey stock, star anise, cloves, cinnamon, peppercorns, shallots, ginger, fish sauce and palm sugar for 30 minutes. Strain the solids from the broth and discard. Place one serving of noodles in each bowl along with 1/4 of the turkey meat and bean sprouts. Pour the broth over the noodles and top with the green onions, Thai basil, cilantro, jalapeno peppers, lime slices, hoisin sauce and chili sauce. I made Pho just today as well! Never made it with turkey though, nice change. Oh how weird. It was so cold yesterday we were thinking about ordering pho out. I think making this with turkey meatballs would also be a really good option. Kevin, Pho was on my menu for this weekend! It’s one of my favorite go to soups! Your pictures always make me want to eat! 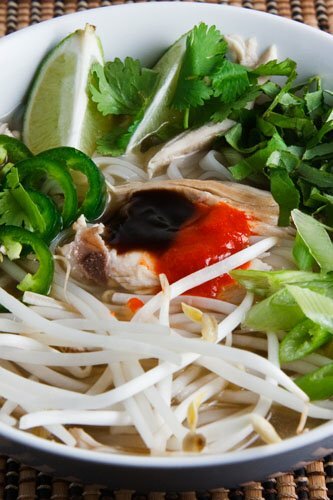 What a great idea of making pho with Turkey instead! Argh, I have been wanting to make some Turkey stock but I never have any Turkey bones…. I love pho! Homemade stock is the best, it tastes so much cleaner. Wonderful how the spices turn the usual chicken and turkey stock into pho stock. I really have to scour the Asian markets at this time of year to have any hope of finding great fresh herbs for pho — not that I ever mind a trip to the Asian grocery store! Happy new year! Best wishes for a joyous and peaceful 2009, Kevin. What’s not to love about something so bright and colorful? I love seeing what you’ve dreamed up for dinner! I’ve never had Pho, but it sure looks good! You sure know how to use up the leftovers! mmm, pho is one of my favorites! lovely. i just wish i had some leftover turkey! Homemade soup stock rules! My turkey bones are in the freezer, so I will definitely try to give this pho a whirl. Thanks for the recipe. That looks great Kevin! Haven’t used star anise before and haven’t ordered pho in a restaurant. Thanks for the recipe! I love making stock, it’s such a special treat when I get around to doing it. This looks just wonderful! I love pho, but have never had it with turkey. I should do a better job of saving the bones for stock like you do. This is a great idea for using turkey … YUM! wow! this is really cool, new imagine of thie turkey pho, very creative! must be awesomely delicious! Pho is one of my most favorite foods. I love this turkey version. Turkey broth… sounds really yummy! Ooh, love pho…never thought to use turkey though, great idea! Happy New Year Kevin!! I have decided that Pho is my favorite soup. I’ll have to try it with some of the leftover turkey that I have stored in my fridge. I love pho, and like most other commenters I’ve never seen it done with turkey. That’s a great idea! Charing the ginger is an interesting idea too. Tons of flavor! Love this sir! Happy New Year… Can’t wait to see another year of amazing posts! Best of luck for year 2009. Only you would think of making Turkey Pho! My Mother in Law would love it! I never had Pho, but I’m going to have to, yours looks fantastic! I have never made pho! I better get on it! It looks fabulous! Happy New Year to you! Happy New Year, Kevin! Hope your 2009 is full of the things you treasure most. I have never had this dish but it sounds wonderful. This one looks so fresh and tasty, great use of the leftovers! Have a wonderul New Year, Kevin. I have never seen pho with turkey but it sounds great. I LOVE pho and get it often for lunch when it’s cold out! That Pho looks so good. I never made it but it looks so easy to make. That looks really good and healthy! I have never charred the shallot and ginger before..everyone loved this..we added lots of crushed red pepper and chile garlic sauce..it was so yummy! Thanks for posting! Fabulous way to start Presto Pasta Nights in 2009…healthy and delicious. Thanks for sharing a great dish. Was on my way to making "standard fare soup" with my leftover Thanksgiving turkey stock I defrosted today when I came across this. Amazingly, I had almost all the ingredients on hand. Came out fantastic!